Huawei is getting back into the Windows game, but this time it's with a PC. Forget Android smartphones, Huawei’s aspirations are going well beyond handsets with the recent introduction of its first-ever PC. The company recently took the wraps off its rendition of the Microsoft Surface with the MateBook, a tablet that transforms into a laptop with the addition of a keyboard accessory. The MateBook is scheduled to roll out in the United States and Canada in the “coming months” starting at $700. Huawei introduced the MateBook, which shares branding with the company’s Mate line of Android smartphones, during Mobile World Congress in Barcelona. Here are five things you need to know about the Matebook...with video! Highlights for the MateBook include Intel’s Skylake Core M-series processor, a fanless design, and a 12-inch IPS touchscreen with 2160-by-1440 resolution and a 160-degree viewing angle. The device also has a 33.7Wh battery that should last around 10 hours under regular usage. MateBook is also jumping into the future with a USB Type C port that supports fast charging, allowing the battery to top up in about 2.5 hours. The impact on you at home: Huawei hasn’t given a specific release date for North America beyond “the coming months.” When it does come out, the $700 base model will feature 4GB RAM, an Intel “Skylake” Core m3 processor, and a 128GB SSD. 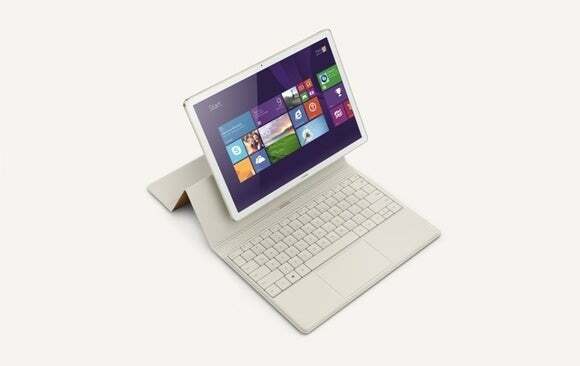 The top model, meanwhile, features a Core m7, 8GB RAM, and a 512GB SSD for $1,600. The MateBook will come in gray and gold. 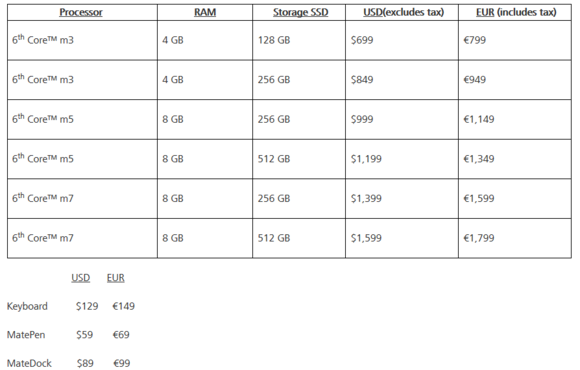 The complete list of MateBook pricing supplied by Huawei is below, with the general admonition that all prices are subject to change before release. 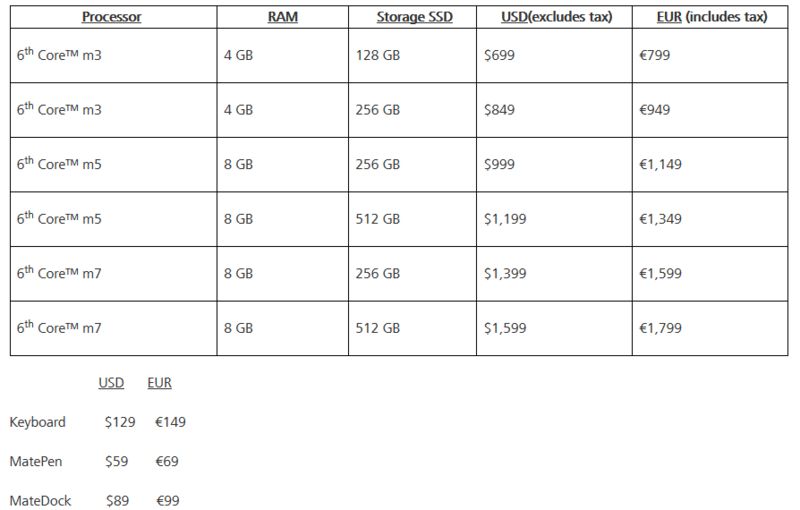 Huawei’s MateBook price list released during MWC 2016. Huawei also got serious about creating accessories for the MateBook. The must-have addition is the $129 Keyboard cover enabling the MateBook to transform into a laptop. Florence Ion gives you a closer look at the Matebook's stylus, with video! There’s also a $60 MatePen with 2,048 levels of sensitivity for handwriting recognition. It also includes a laser pointer for those all-important PowerPoint presentations. Finally, Huawei offers the $90 MateDock, which isn’t much of a dock in the physical sense. Similar to the peripherals we’ve seen for Windows 10 Mobile devices, the MateDock adds ports for HDMI, VGA, ethernet, and two USB ports, allowing you to go big on an external display. Stay tuned to PCWorld for a hands-on video and early impressions of the MateBook direct from the MWC show floor.